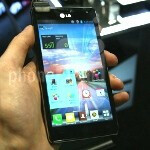 The LG Optimus 4X HD is no joke when it comes to specs - it’s the successor of the first dual-core phone ever, last year’s Optimus 2X, and it packs all four plus one cores of the latest Nvidia Tegra 3. And it’s got the benchmarks to prove it. The 4X HD scored an impressive 4512 in Quadrant, and while that’s slightly short of the 4,909 scored by the HTC One X which also sports the Tegra 3 in its international version, the LG phone managed to beat the One X in AnTuTu. Below are the scores from both handsets in three different benchmarks. To put things in wider perspective, the HTC One S scored around 5,000 in Quadrant in our tests. LG still has some work to do on the device before it gets released, but those scores are promising. Don’t forget to check out our hands on review of the Optimus 4X HD back at MWC and let us know - do you think LG stands a chance with the 4X HD in this year’s hugely competitive mobile scene? Nice... That LG phone should come to at&t. At&t is already getting the one x so how about Verizon instead? Everything with lg is impressive except the time for updating android version which seems to take forever. This will be interesting :) Now, every phone company will put out monster phones. That's super win for the consumers. do i see a 2GB ( ram=2315) ram in there? or M i jus seeing xtra numbers? :/!!!!!!!!! hello i think that's ram score not ram memory. eyephone please change your dp i hate that pic it makes me feel awkward. And lg is awesome. Just saw my uncle's htc one x and the screen was a beauty. Wish lg's screen is better than htc's cause it would be hard to beat super lcd2.